I am happy to report that we are well on our way to slightly warmer and longer days. Not only have we gained nearly 30 minutes of daylight since the shortest day of the year (Winter Solstice), but our average high has now finally climbed above the climatological bottom of 23F! Monday marks the date at which, our average high begins it's climb back to warmer temps. In fact, in a little more than 1 month, our average high will be near the freezing mark!  By the end of January, there will be nearly 1 hour more daylight since the Winter Solstice! Sure, it's baby steps right now, but it helps to know that the some of the coldest and darkest days of the year are now behind us. 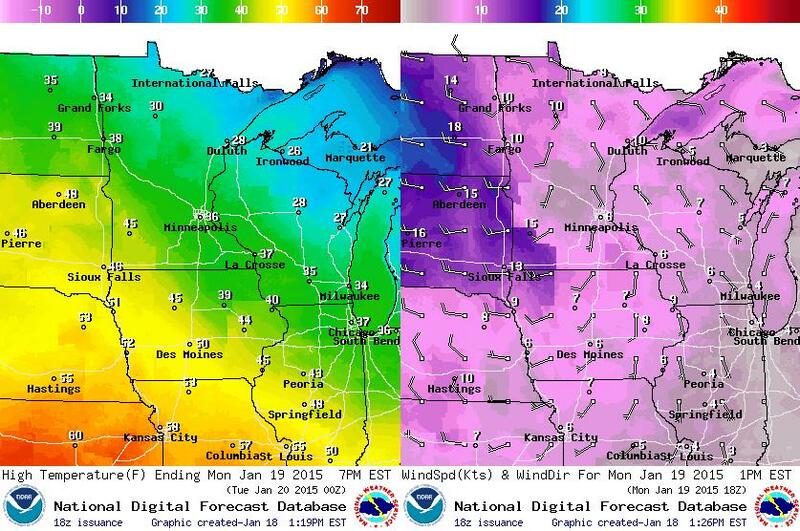 Mother Nature will be kind to us over the next few days as Arctic day remains north of the international border. I actually don't see much in the way of extremely, face numbing cold in our future anytime soon! The warmer weather will help to pull fast moving clipper system through our neck of the woods this week, so chances of light snow will be fairly frequent. In the meantime, your snow blower will continue feeling neglected... I hope mine still starts! SUNDAY NIGHT: Clouds thicken. Low: 22. WNW 5. MONDAY: Mix of clouds and sun. Drippy. Light snow develops in northern MN. High: 35. Winds: Turning SSW 5. MONDAY NIGHT: Mostly cloudy, chance of light snow. Low: 25. THURSDAY: Cooler, sunny breaks.. Wake-up: 15. High: 22. FRIDAY: Partly sunny, light mix late? Wake-up: 18. High: 28. SATURDAY: Cool breeze, some sun. Wake-up: 20. High: 28. 1994: The cold continued from the previous day with -47 at Brainerd and, despite the heat island effect, the Twin Cities' airport hit -27. Due to temperatures being so cold earlier this month, January temperatures are still running nearly 5.5F below average through the first 18 days of the month. The good news is that nothing Arctic seems to be in the offing anytime soon. In fact, through the early half of next week, temperatures will still be nearly 5F to 10F above average. 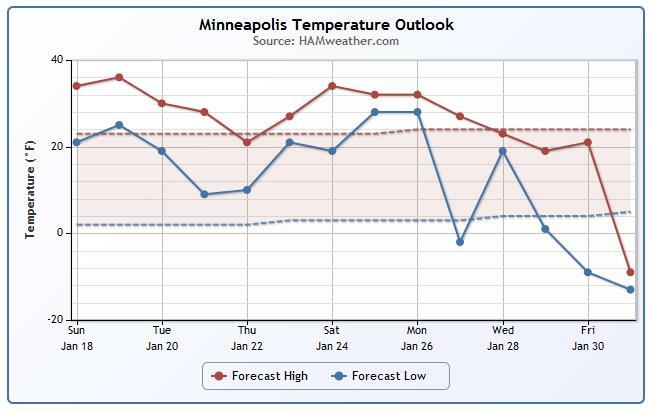 Extended model runs are still suggesting a fairly decent cool down possible by the end of the month/start of February. Ahhh... the weather as of late certainly has been nice, hasn't it? After such cold weather during the early part of the month, readings nearly 10F above average feel amazing! Sunday almost felt like a spring day! 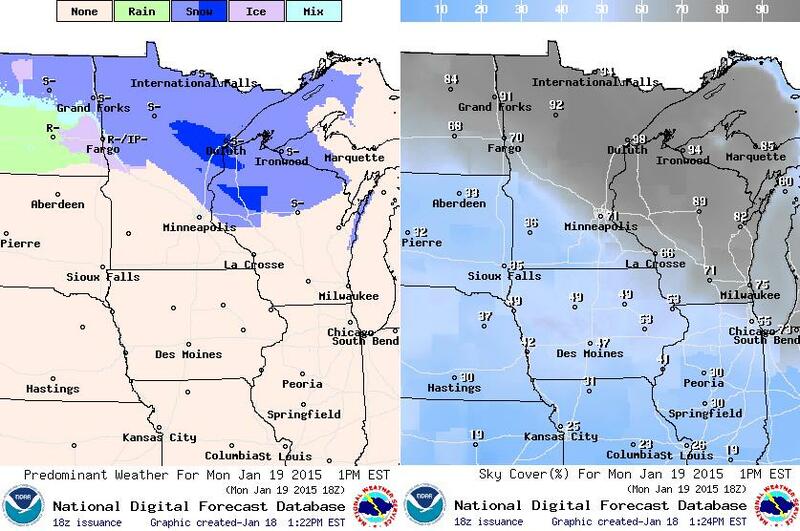 Highs on Monday will likely sneak back into the 40s across southwest Minnesota. However, readings across the northern part of the state will stay in the sub-freezing range. Catch 22. 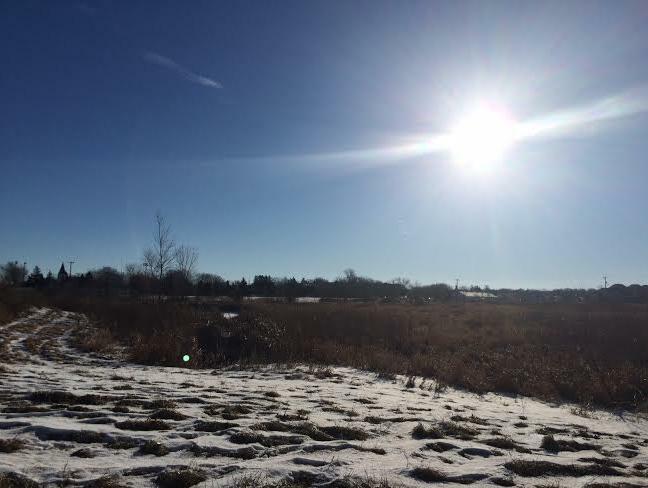 Sunny weather in the depths of winter tend to come by way of cold, Arctic air masses. Those are the ones that sting your face when you walk outside. 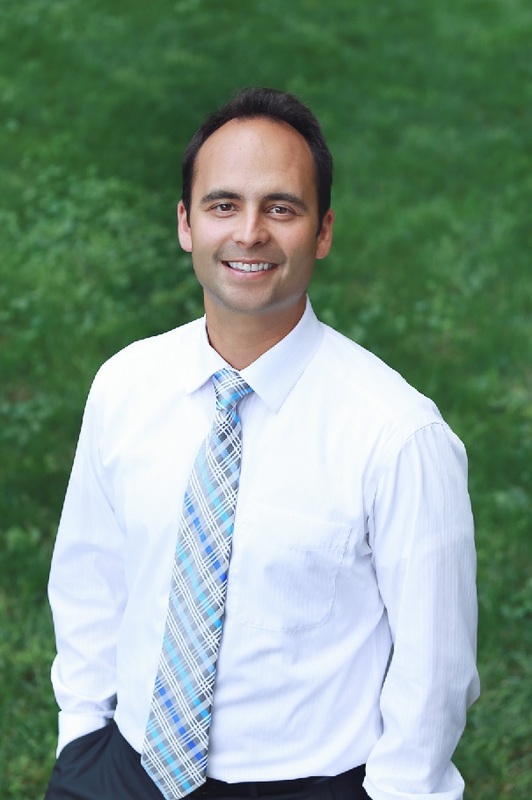 Warmer weather in the winter is typically accompanied by more clouds and precipitation potential. Monday's weather will bring a chance of light snow, mainly across the northern half of the state, while folks in the southwestern part of the state will see more sunshine and very mild, spring-like temps! Active weather in the Pacific Northwest will create fairly active weather conditions for folks in the Upper Midwest/Great Lakes region. 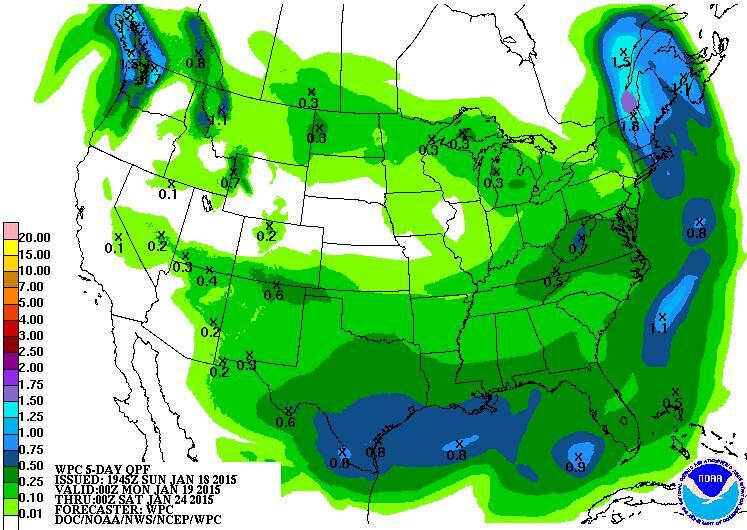 Keep in mind that most of the precipitation will get rung out west of the Rockies. The remnant moisture will find itself in the Upper Midwest early this week with light snow accumulations possible across the far northern tier of the nation. 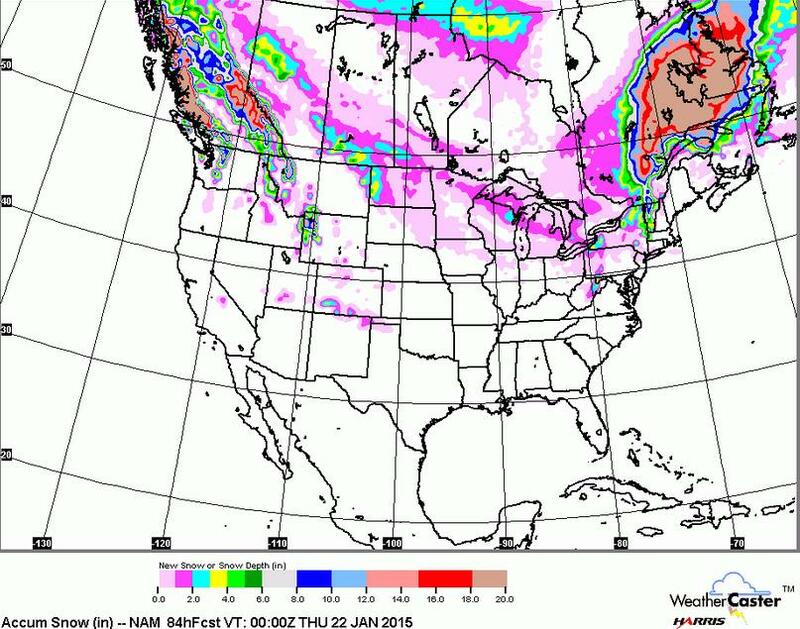 Here's the snowfall potential through midweek. Note that we are still significant snowfall free! Other than some heavier snow across the Rockies and a little light snow across parts of the Midwest, there doesn't appear to be any major systems blowing through the country. 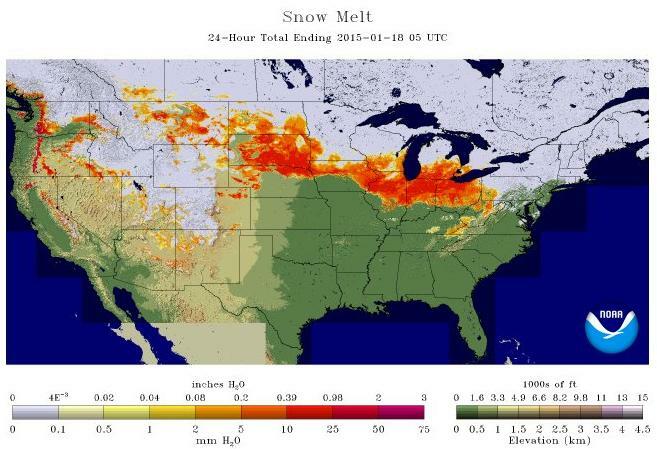 The image below is actually kind of interesting... it shows the 24 hour snow melt from parts of the weekend in orange. Thanks to the recent mild weather, quite a bit of snow melt occurred across parts of the Midwest and Ohio Valley. 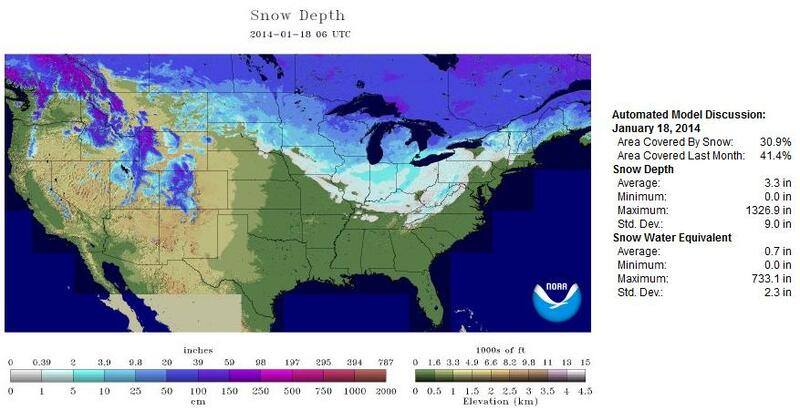 According to NOAA's NOHRSC, as of January 18th, 31% of the nation was covered in snow. Interestingly, there was about as much snow coverage at this time last year as there is this year! 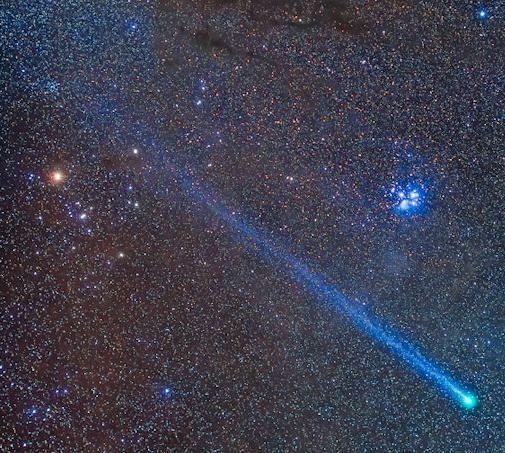 Here's an interesting look at an incredibly long comet tail from Comet Love joy..
"Standing under the stars in the countryside, people are looking up and seeing the green head of Comet Lovejoy not far from the Pleiades star cluster. There's also a hint of a tail, faint but long. Note to sky watchers: It's even longer than you think. Astrophotographers doing long exposures of the comet find that the tail extends an incredible 15o to 20o across the night sky. Alan Dyer, author of "How to Shoot Nightscapes and Timelapses", sends this picture from City of Rocks State Park, New Mexico:"